Avg. Group Discount of 26.1%! 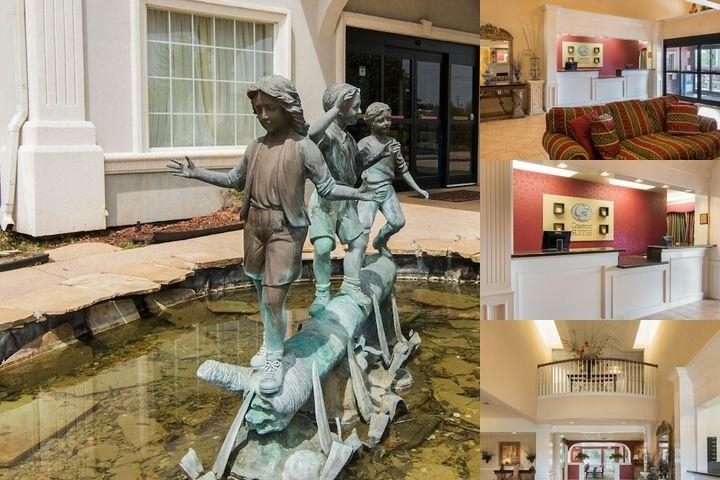 Pulling into the parking lot of this Texarkana, TX hotel, the dancing water fountain near the outside entrance will captivate guests. Upon entering the building, the tastefully decorated lobby resembles that of a luxury resort.This Texarkana hotel features many luxurious full-service amenities, including:Free continental breakfast ,Free high-speed Internet access, andFree local calls.An indoor heated pool and charcoal fire pit are available for guest use. A barbecue grill and putting green are also provided.Business travelers will appreciate the business center, which provides a computer with Internet access so guests can check their e-mail while away from home. Access to copy services is also offered.All guest rooms have refrigerators, microwaves, irons, ironing boards, hair dryers, coffee makers and cable television. Guests can choose from one- or two-room suites. The two-room suite also has two televisions and is ideal for families, long-term guests and business executives requiring extra space.A guest laundry facility is also available. In the evenings, guests can munch on popcorn and cookies provided at this Texarkana, Texas hotel.Whether traveling to Texarkana for business or pleasure, the Comfort Suites hotel is the perfect location for any guest. Must cancel reservation at least 2 weeks prior to a group event. Single reservations may cancel up to 4 pm the day of arrival. Texarkana Regional Airport is located less than 5 miles away. Local Shuttle Info: Airport Shuttle available Mon-Fri 8 am to 5 pm at no charge to guests. Your Morning Breakfast is full of hot and delicious options, making breakfast at the Comfort Suites the perfect way to start your day. Enjoy our free hot breakfast featuring eggs, meat, yogurt, fresh fruits, cereal and more, including your choice of hot waffle flavors! If you're leaving early, a Your Suite Success™ Grab It & Go bag is available for the two hours prior to breakfast. 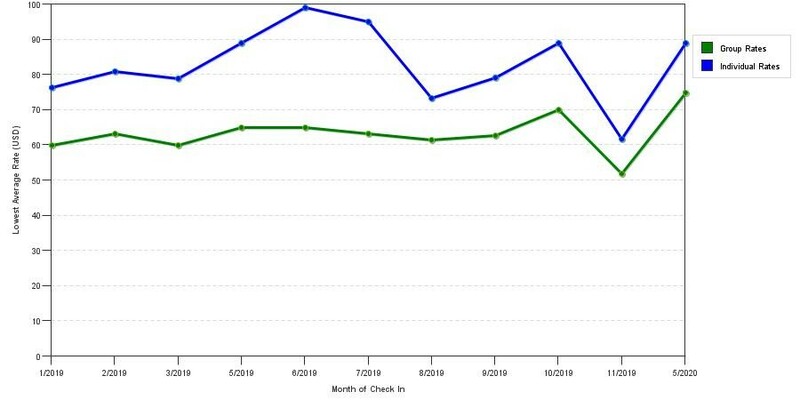 The graph above is seasonality of room rates for both group/meeting quotes and the lowest online individual rates our rate checker could find at the time the group bid was entered. The most competitive group deal shown is 36.5% in February 2017 and the highest average individual rate is $99 in the month of July 2019. This chart will show past seasonality and also project future months. If you are flexible with dates, you may want to consider staying at Comfort Suites in a month when rates are lower. Feel free to use the Comfort Suites meeting space capacities chart below to help in your event planning. Hotel Planner specializes in Texarkana event planning for sleeping rooms and meeting space for corporate events, weddings, parties, conventions, negotiated rates and trade shows. Large Meeting Room is $149 + Tax daily. 25 x 28 x 9 Ft.
10 x 11 x 10 Ft.